October is Breast Cancer Awareness Month. 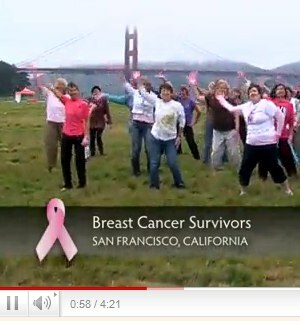 You may remember how excited I was last year when I participated in the latest "Pink Glove Dance" video. Since the original Pink Glove Dance for Breast Cancer Awareness video was made two years ago, it has been viewed over 3 million times on YouTube. I'm still dancing (that's me in the pink shirt on the left above the ribbon)! I invite you to help me celebrate my long journey from diagnosis to five year survivor by clicking on these links and watching the videos. For each click, Medline donates to breast cancer research. Later this month, you can check back on their website to view submissions for the 2011 edition of The Pink Glove Dance. This time of year, the harvest season, is busy all around the country with groups organizing events highlighting healthy food and personal choice. Here's my challenge for all you carnivores: Go veggie for one day. 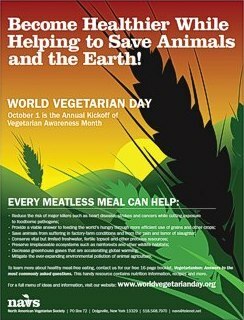 Join the World Vegetarian Day celebration Saturday October 1st. Started in 1977 by the North American Vegetarian Society to increase awareness about plant based diet choices, the event has gained momentum over the years, with vegetarian and vegan events right around the planet. The local San Francisco Vegetarian Society is hosting their annual event in Golden Gate Park. Loyal readers of my newsletter will recognize several of the names of my food heroes on their schedule for the weekend: among many other speakers, they'll be welcoming T. Colin Campbell and John Robbins. World Food Day, October 16, is an international day of action against the hijacking of our food by agribusiness, this year with special attention to the greediest company of all, Monsanto. Activities are planned in over 36 cities across the US. People are fighting mad and coming out to join their voices in protest. You have read plenty here in this newsletter about the struggle to regain our right to choose what we eat. This idea is the common thread for rallies, events, marches, meet ups, get-togethers, lectures, and small back yard picnics. To find an event near you, check out the World Food Day Rally Map. The GMO issue is heating up and The Millions against Monsanto "Right to Know" march from New York City to Washington will culminate on October 16th at the White House. Let's see who's paying attention in Washington when all these people get there !! Right here at home, my friend Pamm Larry has been working to organize our very own California Ballot initiative for GMO labeling. Here, as in so many "green" initiatives, if we can make it policy in California, other states will follow. A million signatures are required for the initiative to be placed on the November 15th, 2012 state wide ballot. I urge you to surf over to the initiative's website now and sign up for emails alerts and updates. If you can, offer some time to help get those signatures. We only have 180 days to get 1 million signatures, but we can do it !! All month long Community Market Santa Rosa is promoting non-GMO certified products. On October 16th they will host a non-GMO potluck and a screening of the movie "The World According to Monsanto". There will be speakers and loads of information so stop by if you're in the neighborhood. I'll be there. Please visit our website for the latest Potluck information. Find past articles by clicking the Articles tab in the menu. The last article was "Food Fight" with more information on GMOs. Label Reading 101 will help you to choose your foods mindfully. Join us on Facebook, where we can share photos, recipes, tips, reviews and questions! Last month as we went to print CNN was scheduled to air a documentary special called "The Last Heart Attack", with the program postponed due to breaking world events (the Libya crisis, then Hurricane Irene) the program missed our press deadline. Many of you may have seen the special, and I know even more of you have been hearing about it as it makes waves in our plant-based diet community. Dr. Sanjay Gupta, CNN's wonderfully informative medical correspondent, brought another round of credible experts to the media forefront. The show featured a candid interview with President Clinton, but also brought Dr. Caldwell Esselstyn, and my hero T. Colin Campbell, and several others together to make this another Media that Matters moment. If you missed the program, watch it online here. Chalk up one for the little guys: Last month I told you about Chico Bag one of my favorite little, local companies, and the crazy lawsuit filed by the big plastic bag companies. All charges were dropped and everything settled. Seems two of the three backed out of the lawsuit and the lone originator didn't want to push by themselves. I guess bullies figure they need to be a gang to beat the little guy, and this time their gang fell apart. Three cheers for our side! I know I've talked about CSAs (Community Supported Agriculture) in these newsletters before and you can read more about it here. My husband Mike and I have been happy veggie box consumers for over ten years now. Many folks can get their weekly box from a local farmer, thereby helping build agricultural self-sufficiency in their communities while reducing the amount of fossil fuels consumed getting the food from farm to table. For those of you in cities, this can be a harder thing to accomplish. Here's a new veggie box purveyor that will get you a Green Polka Dot Box FedExed right to your doorstep every week. The part of their claim that has gotten my attention and what sets them apart from the competition is the guarantee that there is nothing but Non-GMO fruits and veggies in each box as certified by the Non-GMO Project. As the weather turns a little chilly at night I begin to think about those autumn days ahead. A nice warm soup garnished with those last remaining hot peppers from the garden sounds perfect. Here's my version of "Fiery Lava Soup". Thanks again for reading � remember this month � SAY NO TO GMO's !! and get out there and tell someone you love to get fighting mad and stand up for the right to know what's in our food. Recruit your California friends to sign a petition for their November 15th, 2012 ballot initiative.